I haven’t cooked much in the last several weeks due to travel and my crazy Sharathon work schedule. 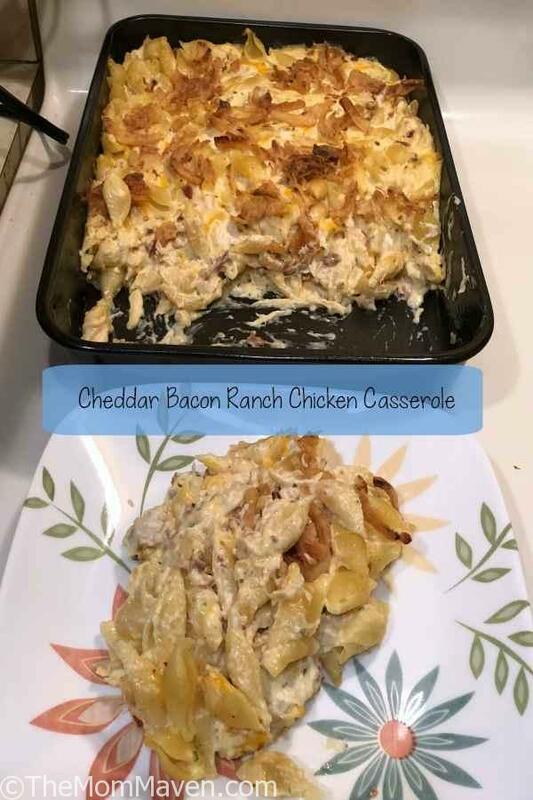 I am way past time in creating a new recipe so I focused on that this week and I came up with a winner, Cheddar Bacon Ranch Chicken Casserole. I have shared other recipes with this flavor combination, like my Cheddar Bacon Ranch Chicken Salad, Cheddar Bacon Ranch Chicken, and my Bacon Cheddar Dip. This is just one of those flavor combinations that I love. 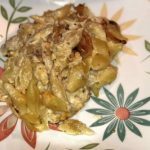 I took those flavors and added some shredded chicken, pasta, and a few other ingredients and made a new, easy, and delicious week night meal. Yum! This cheddar bacon ranch chicken casserole is an easy and delicious week night dinner that the whole family will enjoy. Lightly grease a 9"x 13" baking pan. While pasta is cooking, in a large bowl mix together the cream of chicken soup, dry Ranch dressing mix,, shredded cheddar cheese, sour cream, and bacon. Add the chicken to the soup mixture and stir to combine. Once the pasta is cooked and drained, add it to the large bowl and fold in to the mixture. Pour the mixture into the prepared pan. Spread to the sides using a silicone spatula. Sprinkle the French's fried onions on top. Bake for 25 minutes. Enjoy! Make sure you always have shredded or chopped chicken on hand in your freezer. Move it from the freezer to the refrigerator in the morning so it will be ready to use in the evening. This recipe was a huge hit, Ron even agreed to eat leftovers <gasp>. Our friend RB was over working on Ron’s truck so I invited him in for dinner and he said it was really good and would go well with a Dr Pepper. I hope you enjoy this recipe and all of the easy recipes I share here on The Mom Maven. I hope you share them on your social networks. I just ask that you not copy and share the entire recipe with photos. Please use the sharing buttons below and share the link to this post. Thanks!